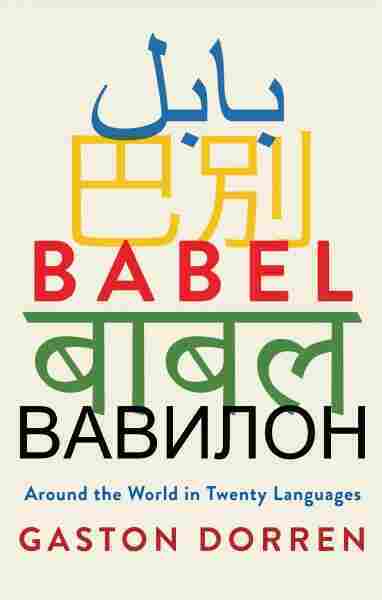 'Babel' Looks At Language Through The 20 Most-Widely Spoken Linguist Gaston Dorren's book is endlessly interesting — and you don't have to have any linguistic training to enjoy it: He has a talent for clearly explaining even the most difficult concepts. For centuries, people have used mythology to try to make sense of the fact that the people of the world speak so many different languages. One example of the origin story of the "confusion of tongues" comes from the Old Testament — God confounded the language of the people as punishment for trying to build the Tower of Babel, the story goes, which they did in attempt to physically reach heaven. Linguists are understandably reluctant to take the Bible's word on the subject, though. But you don't need to understand the history of the multiplication of languages to get that there's a lot of them. "Counting the world's languages is as difficult as counting colours," Dutch linguist Gaston Dorren writes in his fascinating new book Babel. He concurs with the conventional wisdom that there's about 6,000 different tongues in the world today: "Such amazing diversity — what a Babel we live in!" Trying to write about every single language would be a fool's errand, of course, so in Babel, Dorren sets out to describe the 20 languages with the most speakers worldwide. There are the usual suspects — Arabic, Mandarin, English — as well as some possibly unfamiliar to English speakers in America, like Tamil and Javanese. Dorren confesses that he considered "having a go" at learning all of them, but contents himself with the six languages he already speaks and the nine he reads. In his chapter on the Tamil language, Dorren turns to history, writing about the 1956 Sinhala Only Act in Sri Lanka (then Ceylon), which refused to acknowledge Tamil as an official tongue in the country. The act sowed discord that lasted for years; in 1964, Dorren writes, a Tamil school principal immolated himself, yelling his last words: "Death to Hindi! May Tamil flourish!" It's a stark reminder that language is frequently a vital part of a culture's identity. Dorren has an eye for what makes languages stand out from the field. In his chapter on Javanese, which is spoken widely in Indonesia, he writes about "krama," the language's formal register, which is tied to class and loathed by many of its speakers. And in his look at Japanese, he considers "women's language" — a distinct spoken register that female speakers were once expected to use. In the hands of a less gifted author, some of the material in Babel could come across as dry or intimidating. But Dorren (as you might expect) has a way with language, and an arch sense of humor — he aptly describes German, with its many eccentricities, as a "weirdo" of a language. And he has no use for the French government's efforts to keep its language "pure," despite actual French people being open to changes, writing sarcastically, "Hey, they're only the people. They don't get to decide what French culture, linguistic or otherwise, should be like." Dorren's conclusion that English "is the end of Babel — or rather, it's the end of Babel as a problem" might not sit well with speakers of other languages (Mandarin, Dorren contends, is "just too damn difficult" for non-native speakers to learn), but he's careful to note it's only because of the English language's ubiquity and America's position as a superpower that it's so widely spoken. But the great thing about Babel is that you don't have to agree with Dorren's conclusions to enjoy it — it's a book that's as joyful as it is educational, and above all, it's just so much fun to read.